Bienvenue à Avalon! Cette maison unifamiliale de trois chambres est située à l'extrémité nord de Carolina Beach et constitue l'endroit idéal pour vos prochaines vacances. La maison dispose d'un plan d'étage ouvert, d'une cuisine avant, d'un salon et d'une salle à manger donnant sur une véranda avec vue panoramique sur le canal. La chambre principale dispose d'un jacuzzi qui surplombe l'eau. Il y a deux chambres supplémentaires et trois salles de bains. La cour clôturée est un plus pour votre membre de la famille à quatre pattes. Had a great time at the beach for our Christmas vacation 2018. Had a few issues with property. No hot water in one of the showers, roaches in the house small and large, kitchen not set up with smallwares, hot water heater to small to use jetted tub in master. Feel like we should have received some type of credit for all of the items listed above. Reported issues to Bryant Realty but they did not make any concessions for inconveniences at rental unit. When we came home we left all luggage in our detached garage to make sure we did not bring roaches in our home. Reading the guest book all of our concerns had been mentioned numerous times but owners and Bryant Realty have not corrected issues. If they correct all of the concerns, this would be a prefect property. It has a very nice great room for the family, all bedrooms are large, has a great view of the intercostal waterway. Very good beds and furniture. Hi Jay- Thanks for your feedback. Glad everyone had a great time during the Christmas holiday... Christmas at the beach is alway a good choice! We are sorry to hear you had a few issues during your stay. We have looked into all mentioned concerns and addressed accordinlgly. Hope to see you at the beach again soon! 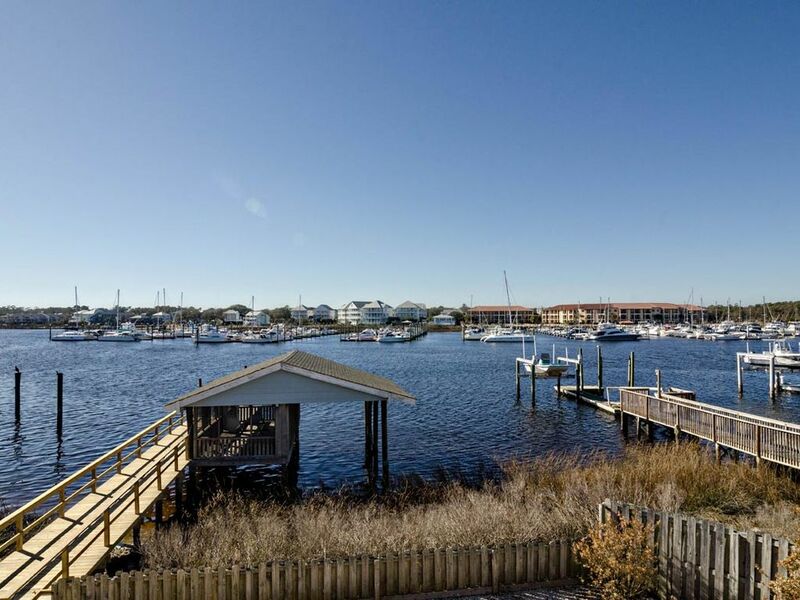 It is a very clean and comfortable beach house with great water access for kayak launching. The kitchen is well equipped and the living room has several comfortable chairs and couches. Wonderful screened porch along the back but the furniture is a little ragged and random out there. Great water views of the marina across the way. The house is a little dated but very comfortable. We would definitely come back. This was a vacation gathering for our family and our dog. We visit Freemon Park regularly and chose this because of the location and dog friendly atmosphere. Quite a relaxing and enjoyable experience on the harbor! My dog Haley did not want to leave. Very impressed by the clean-up after the hurricane. Made our vacation experience delightful! Kudos to Bryant Realty! This was a beautiful location. Sitting on the screened porch drinking coffee in the morning was amazing. The house was roomy and comfortable. The fenced in back yard was great fror our dog. The kids and adults alike enjoyed fishing and crabbing on the dock. Great accomodations if you have a boat. My family will definitely stay here again. This vacation home is wonderful for my family. It absolutely exceeded my expectation. The home is spacious and clean. It has a gorgeous waterfront view. Fishing, crabbing and casting are extremely convenient. Drew the Maintainence staff from Bryant Reality helped us out with our boat during heavy rain storm. He truely cared his tenants. I highly recommend this beautiful vacation home to others.